As I was stitching along on the christening gown today, I had an aha moment I thought I would share with you. I am using floche on silky voile for the gown. In stitching these "flourishes" on the gown, I was reminded of something I had forgotten. Floche is a soft twist fiber. It covers nicely for padded satin stitch as well as shadow work. I will admit that it is not always my first thread of choice, but it seemed to be working well for me. It's also no secret that I am under the gun with this project. Sometimes when we are under the pressure of a deadline we tend to try to take shortcuts or not go back and fix stitching we aren't happy with. That was my dilemma today. See the curly q on the top left? That was the last one I stitched in this group. See how smooth the top and edges are? Well that is the look I was going for. If it had turned out as lumpy and frumpy as the first two I probably would have left it. But since it didn't I was in a quandary. Do I take out the good one to make it match the two "carpy" ones? Of course not! So I either left them looking decidedly different, or I had to take out the first two to make them match the look I was going for. So some reverse stitching was in order. (Always be careful when removing stitching. 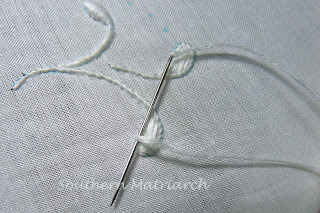 Go slow so you don't snip the fabric instead of the embroidery thread. Ask me how I know. As I said, floche is a soft twist fiber. 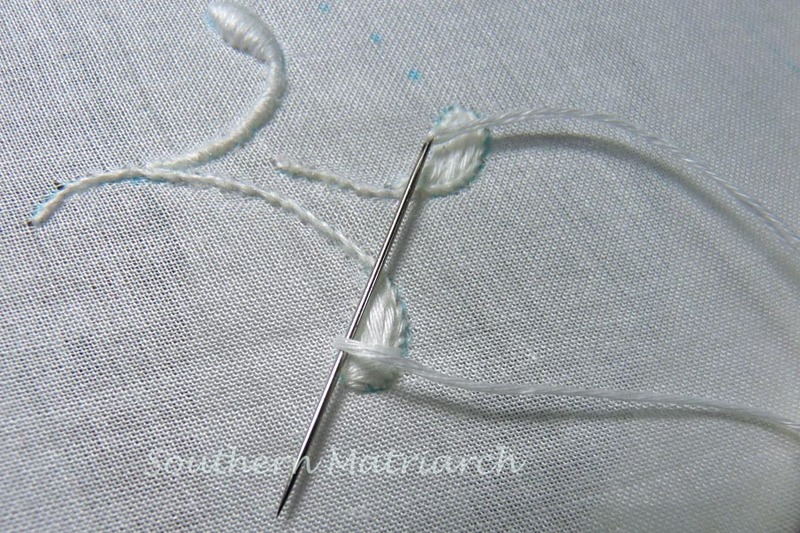 You can get it to unfurl or flatten out by either threading one end in the needle over the other or you can untwist it as you stitch with it. Since I can never remember which end is which, I just uncurl as I go. In the picture above I have done this. Just simply twisted in the direction needed to get the individual fibers to separate and be more ribbon like. In this picture I have done the exact opposite. I have twisted it to make it more rope like. 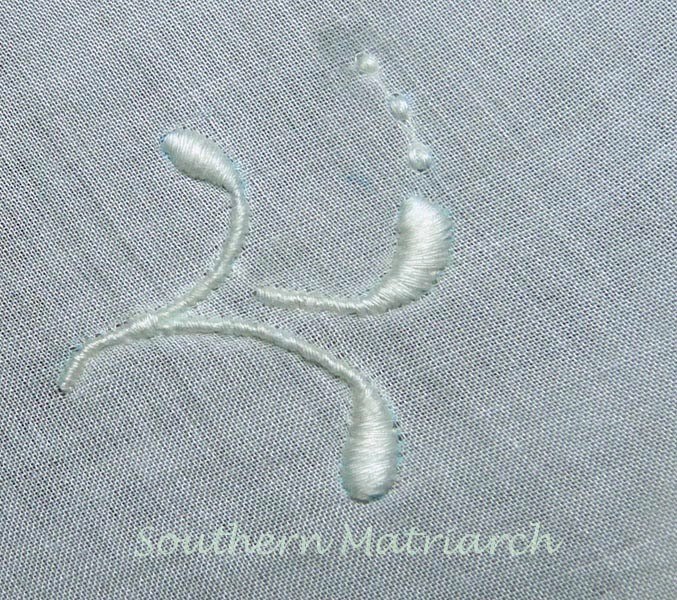 When trying to satin stitch, the tighter twisted thread will result in the more jagged edges seen in the first photo. Here are my curly q's restitched. The edges are smoother. They still aren't perfect to me, but this picture is taken through the magnifier. After it is washed, the fibers will fluff up even further. Finally when it is draped down the front of a moving baby, or hung on a wall, those edges won't look as jagged. I am not as happy with the stems, but twice is my limit for removing something. DISCLAIMER: A friend and I have had several conversations of late about the popular opinion that there is only one "right" way to do things. There is NO ONE RIGHT WAY to do anything! I don't care what book states what method, or what method one pattern designer uses over another. I am sharing with you, what worked for me. I am not a self professed authority on anything. Nor is anyone else. 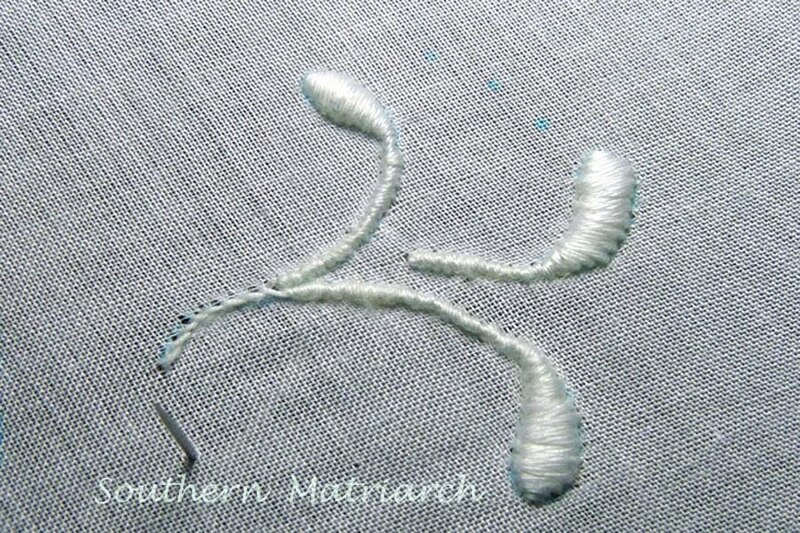 Sure some stitchers have more experience than others, but everyone has their own approach. 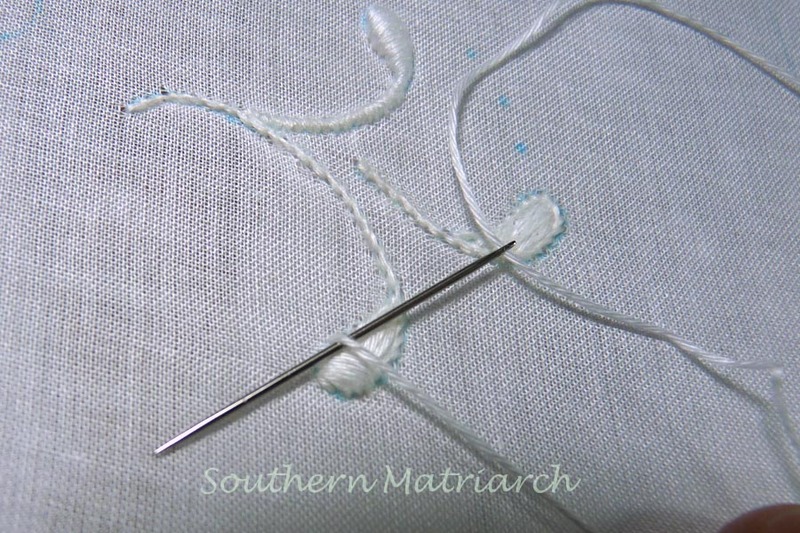 A more experienced stitcher is just that, more experienced. Remember your mother always telling you practice makes perfect? They have just been practicing longer. Don't let yourself be sucked into thinking there is only one correct way or for that matter into thinking that your way is wrong. If we are striving to enhance our skills then we are all learning from each other. I happen to like tiny, tiny bias binding for instance; you might like a larger bias binding. Its not right or wrong. It is all a matter of preference. Not authority. So don't let anyone rain on your parade. You're right, people sometimes get a little hung up on The Right Way to do things. It's better in some cases to just work out your own way of doing something, and pay no attention to anyone else! Oh your work is so beautiful. If you had not pointed out anything I would not have noticed. You are really good at what you do. How did you learn all of this? My 15 year old Granddaughter is learning to make quilts and I always tell her that there is no mistake. That is how we learn. Your stitching makes me green with envy!! I wish I had the practice under my belt that you do. And thank you for that testimonial!!! I have long felt the same way, but it is so refreshing to hear someone of your stature in this field say it outloud!!! Martha...your work is exquiste...I expect you will be teaching the 'Martha B' way someday. ;-) And your point about right way is well said...I get very frustrated when I here...that's the wrong way....la la la...Your gown will be lovely..Blessings as you stitch. Me thinks those first two flourishes were not so bad -- but know you are happier with them now! I agree with your disclaimer. I would rather see someone stitch, complete, enjoy and please themselves with a project, instead of fret and worry over doing it the "right" way to please someone else. It never hurts to try a different way. We grow with each thing we do, and learn the best method for us. WAIT!!! You mean the Right way to do something ISN'T my way? Rats!! Martha, you are the perfectist perfectionist and your work is so beautiful!! That sweet baby is going to drool all over your perfect stitches!! Lovely! Can't wait to see the finished gown. I told my aunt once about an imperfection in my daughter's dress. She said, "On a galloping giraffe, no one will notice!" Good to know about that twist with floche. If I ever get over my fear of padded satin, I might use it one day. I am still chuckling over your disclaimer...so much so if I post anything else it will be too much! Amen! If I have learned anything in my long sewing history it is that there is always more than one way to stitch something. I say we should try different techniques and then use what works best for us individually. There definitely is no "perfect" lesson in the sewing world. When I had my homebased business, sewing, teaching and selling heirloom sewing supplies, some who bought would say, "Mrs S says that this is the only way to do it and I can't get it to look like hers.". As an educator, I know well that we don't all learn the same, so why should there be an "only" way to do something. I would tell my customers and that if you can accomplish the technique, no matter how you did it, it's right. I loved teaching one on one or in small groups to see how each person learned. Love seeing you demonstrate the stitches. I love your whole philosophy on the "right way" of doing things. When I'm teaching someone new to smock, they will often ask if they should take something out. I tell them I will never say they should take out stitches, if they are happy with it, that is all that's important. I'm my own worst critic and it sounds like you are also. And it doesn't really help for someone to say not to be so hard on yourself. Everyone says your stitching is beautiful and they are right. Absolute perfection - even with the disclaimer...LOL! Seriously your stitches are pure perfection - thanks for sharing! Oh dear, my normal stitches look like your bad ones! The embroidery is just lovely and I'm sure you will finish with time to spare. I totally agree with the disclaimer. That's why we take classes and read how others approach a stitch or a problem, to learn different methods.